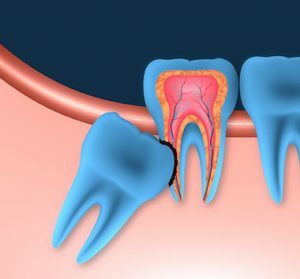 When the inside of a tooth becomes infected this can feel very painful and will require treatment. At Broseley Dental Practice, our dentists can perform root canal treatment to clean the inside of the tooth and remove the infection. The nerve or dental pulp inside a tooth becomes vulnerable to infection if the outer layers have cracked or been damaged. A nerve infection can result in pain, swelling and general discomfort so it is important to treat the problem as soon as possible. Your dentist will ensure the area being treated has been numbed with local anaesthetic prior to starting the treatment. They will then gain access to the nerve and clean the infection from the nerve, using files and disinfectant. The dentist will end the procedure by using a crown to strengthen and protect the remainder of your natural tooth. If our dentist has problems accessing the root of the tooth, or the site of the infection, we may refer you to an endodontist – a specialist in treating internal dental problems. You may also be referred to a specialist if you have recurrent root canal infections.